Though the motives Robert Lewis Dear, the shooter at the Colorado Springs Planned Parenthood, are not known as of this writing, nearly all the speculation is that he was motivated by opposition to abortion. Whatever the shooter's motives were, what he did was wrong. Whatever the shooter's motives were, officer Garrett Swasey, a pro-life co-pastor who was killed trying to protect the patients and staff at that Planned Parenthood, is the hero of Colorado Springs. Whatever the shooter's motives were, the entire prolife movement stands against anybody who thinks that the way to stop abortion is by killing those trapped in the evil of abortion. Many of the most passionate activists against the violence that is abortion were once abortion workers themselves. The most high-profile is Abby Johnson, an ex-Planned Parenthood manager who now heads And Then There Were None, an organization dedicated to reaching out to abortion workers in love to rescue them from the evil of abortion work. Abby Johnson and Garrett Swasey are what the prolife movement is all about: RESCUE. Rescuing babies slated for abortion, rescuing women who feel that abortion is their only option, rescuing the people inside clinics who are in danger from deranged gunmen. 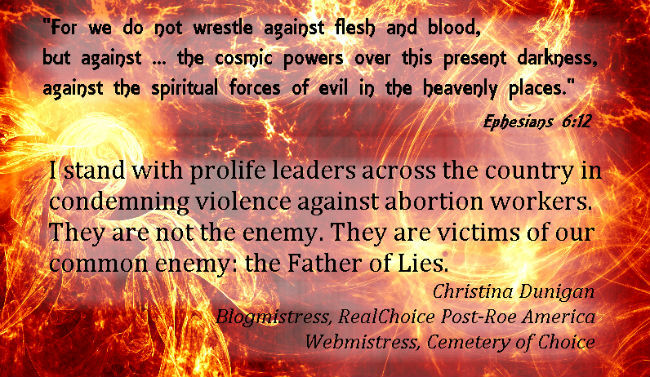 As blogmistress of Real-Choice Post-Roe America and webmistress of the Cemetery of Choice, I join prolife leaders across the nation in condemning violence against abortion workers. They, like the innocent children and despairing mothers, are of incalculable worth, precious human beings made in the image and likeness of God. Call for Comments from Pro-Choice Readers: What do you think? Let's imagine for a moment that we had Star Trek style technology available and that made "beaming" the z/e/f (zygote/embryo/fetus) into a biohazard container the preferred and safest abortion method. Let's say that the technology was further modified so that the z/e/f could be beamed instead into an artificial womb where it could complete gestating and be placed for adoption. Let's say that the entire cost of the artificial womb were paid for voluntarily by pro-adoption people so that there was no additional expense to the woman or to her insurance company or to the government. Would you consider beaming the z/e/f into the safe place to be an acceptable alternative to beaming it into the biohazard container? Or would the destruction of the z/e/f be a key and non-negotiable component of the right to end the pregnant state? At the age of 41, Karnamaya Mongar had survived nearly 20 years in a refugee camp in Nepal. What she was unable to survive was a visit to an American abortion clinic. Karnamaya, her husband, Ash, their three children and one grandchild arrived in the United States on July 19, 2009 as part of a resettlement program. Karnamaya was more than 18 weeks pregnant when went to a clinic in Virginia for an abortion. But the Virginia clinic, and another in Washington, D.C., did not do abortions that late in the pregnancy. 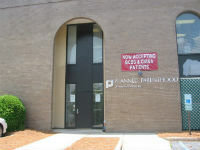 One of the clinics referred Karnamaya to Kermit Gosnell's Women’s Medical Society in Philadelphia because Gosnell had a reputation for performing abortions regardless of gestational age. 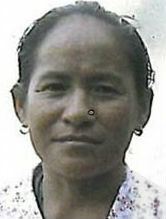 Karnamaya went with her daughter to the Gosnell's clinic on November 18, 2009. That afternoon, Latosha Lewis, who had completed a medical assistant course but had never been certified, conducted the clinic’s version of a “pre-examination,” which was so scanty it didn't even involve weighing the patient. Falsified informed consent forms were added to Karnamaya's file. After the "pre-examination" was done and the paperwork was completed, Randy Hutchins, a part-time physician’s assistant who worked without State Board of Medicine approval, inserted laminaria to dilate Karnamaya’s cervix and administered Cytotec to soften it. Hen then told Karnamaya to return the next day to complete the abortion. Karnamaya arrived at the clinic on November 19 around 2:30 p.m., accompanied by her daughter and her daughter's mother-in-law. At the front desk, Tina Baldwin gave Karnamaya her initial medication – Cytotec to soften the cervix and to cause contractions; and Restoril, a drug that causes drowsiness. After giving Karnamaya the medicine, Baldwin told her to wait in the recovery area until the doctor arrived to perform the abortion. Lynda Williams and Sherry West, who were without any medical-related qualifications medicated Karnamaya in the “recovery room” while she waited for Gosnell. Karnamaya's daughter, Yashoda Gurung, told the Grand Jury that she waited with her mother in the recovery room for several hours. During that time, between 3:30 and 8:00 p.m., her mother was given five or six doses of oral medicine and repeated injections into an IV line in her hand. As usual at Gosnell's clinic, no equipment was available to ensure proper monitoring of vital signs. Yashoda did not know what drugs her mother was given, but typically employees gave repeated injections of the concoction of sedative drugs that Gosnell referred to as a “twilight” dose. 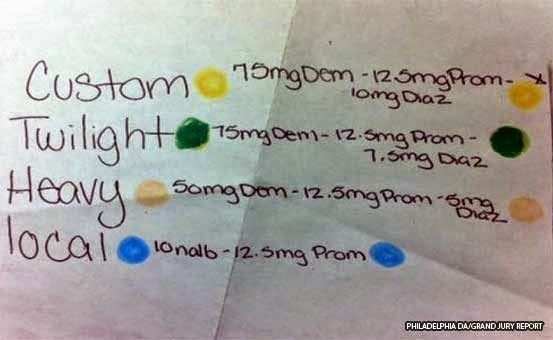 Each of these “twilight” doses, repeated a number of times at the discretion of the unlicensed workers, consisted of 75 milligrams of Demerol, 12.5 milligrams of promethazine, and 7.5 milligrams of diazepam. 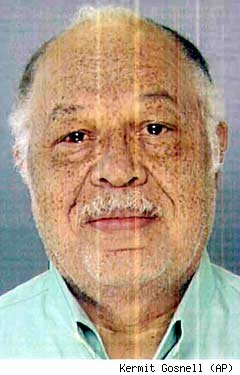 The standard practice was for Gosnell's untrained staff to give repeated doses of sedative and pain-killing drugs to the patients, without regard to a woman's size or weight, whenever it was deemed necessary by the untrained staff. For example, if the woman started moaning, she was presumed to be in pain, and would be given another dose of drugs. Karnamaya, at only 4'11" in height and 110 lb. in weight, would have been endangered by a dose appropriate for an average-sized women, much less by the massive doses administered at Women's Medical Society. A little before 8:00 p.m., West and Williams sent Karnamaya's daughter to another waiting area. She was left there, with no idea what was happening to her mother until the ambulance arrived after 11 p.m.
Williams helped Karnamaye into the procedure room, put her on the table, and drugged her again, this time with the clinic's "custom" dose of 75 mg. of Demerol, 12.5 mg. of promethazine, and 10 mg. of diazepam. The heavily drugged patient was then left, unattended and with no monitoring equipment, alone in the procedure room. Sherry West told detectives that, some time after sedating Karnamaya, Williams came out of the procedure room, yelling for help. West said that when she later entered the procedure room, Gosnell was there trying to perform CPR on Karnamaya. Lynda Williams summoned Eileen O’Neill , an unlicensed medical school graduate who worked at the clinic, from her second-floor office. O'Neill told the Grand Jury that she thought Karnamaya was already dead by the time she got to the procedure room, but she took over administering CPR because Gosnell wasn't doing it correctly. Gosnell, meanwhile, left to retrieve the clinic’s only “crash cart” (the emergency kit to treat a cardiac arrest) from the third floor. After returning with the kit, however, Gosnell did not use any of the drugs in it to try to save Karnamaya's life. Instead he just looked through them and seemed pleased that they were up to date. He seemed purely interested in keeping outsiders from finding out that the crash cart had been nowhere near the procedure room while patients were being sedated. O’Neill testified that Gosnell told her not to administer Narcan, a drug that could have reversed the effects of the Demerol. She said that Gosnell told her it would not work on Demerol. O’Neill also said that she tried to use the defibrillator to revive Karnamaya, but that the paddles did not work. It was after 11 p.m. – long after O’Neill had decided that Karnamaya was dead and returned to her office – that Lynda Williams finally asked Ashley Baldwin to call 911. 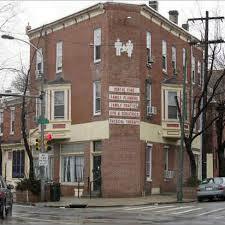 Ashley then went into the procedure room and found Gosnell alone with his dead patient. He told Ashley to turn in the pulse oximeter, which they should have been using all along to monitor Karnamaya's pulse and blood oxygen. This surprised Ashley, since Gosnell knew that the pulse oximeter had been broken for months. Emergency personnel arrived at 11:13. They found Karnamaya lifeless in the procedure room and Gosnell just standing there, not doing anything. The paramedics immediately intubated Karnamaya to give her oxygen, and started an intravenous line to administer emergency medications, since for some reason clinic staff had removed the IV line they'd been using all day to drug their patient. They also failed to tell the paramedics about the drugs they had administered. The medics were able to restore weak heart activity. But getting Karnamaya to the ambulance was needlessly and dangerously time-consuming because the emergency exit was locked. Gosnell sent Ashley to the front desk to look for the key, but she could not find it. Ashley told the grand jury that a firefighter needed to cut the lock, but “It took him [20 minutes]… because the locks is old.” Karnamaya's daughter and friend ran outside, crying, and witnessed this. After cutting the locks, responders had to waste even more time struggling to maneuver through the cramped hallways that could not accommodate a stretcher. When the ambulance arrived at the hospital shortly after midnight, Karnamaya had no heartbeat, no blood pressure, and was not breathing. After aggressive resuscitation efforts, doctors were able to restore a weak heartbeat. Karnamaya was then sent to the Intensive Care Unit, where she remained on life support until family members could make the trip from Virginia to say good-bye. She was pronounced dead at 6:15 p.m. on November 20. She had died of a massive overdose of Demerol. On November 20, 1925, 29-year-old Anna Kick died in Chicago's Washington Park Hospital from an abortion performed that day at an undisclosed location. The coroner determined that a midwife was responsible for Anna's death, but did not determine the midwife's name. On that very same day, 23-year-old Helen Bain, a homemaker, died in Chicago from complications of a criminal abortion performed that day. 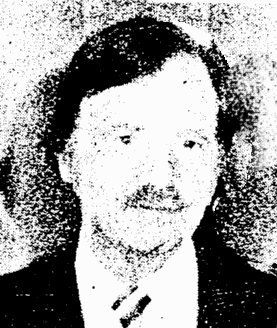 Dr. George Slater was arrested on November 21 for Helen's death. Slater was indicted by a grand jury for homicide on May 1, 1926. 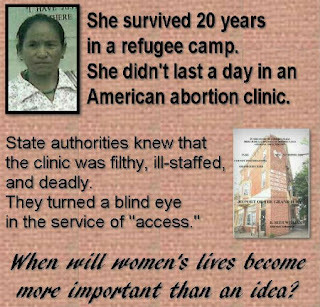 Helen's abortion was typical of criminal abortions in that it was performed by a physician. The mantra among abortion-rights organizations that before legalization, the world of abortion was a world of rusty coathangers and untrained quacks is false. In fact, it's an insult to the abortion-minded women of yesteryear to assume that they were all so mentally unhinged or utterly mindless as to reflexively reach for the rustiest knitting needle in the basket. The vast majority sought out professionals of the same caliber they'd go to for any other obstetric or gynecological issue, as Anna went to a midwife. On November 17, 1935, Georgia Marie McGill, 21-year-old daughter of oil company superintendent George McGill, died from an apparent criminal abortion in Pawhuska, Oklahoma. Marie's father identified Dr. W. R. Mitchell as the perpetrator. Mitchell was already a reputed abortionist, and police had already gotten many complaints about him prior to Marie's death. He was implicated in about half a dozen other abortion deaths, but I have been unable to get more details about those cases. Mitchell was arrested and tried but the case ended with a hung jury. After the trial, Mitchell resumed his abortion business and was arrested again for his practice. Marie's abortion was typical of illegal abortions in that it was performed by a physician. Keep in mind that things that things we take for granted, like antibiotics and blood banks, were still in the future. For more about abortion in this era, see Abortion in the 1930s. With the upcoming anniversary of Roe vs. Wade, life advocates are planning marches, vigils, and rallies across the country. I first saw these tombstone signs in a picture of an Operation Rescue rally in Wichita back in the 1980s. They're a powerful reminder that women are still sometimes paying the ultimate price for the belief that they and their unborn children are mortal enemies. Imagine the visual of a sea of these marching past a group of the uninformed, or a contingent of abortion-rights counter-protestors. They'd also make a spectacular stationary display in the form of a cemetery that visitors can wander through, reading the signs and learning about the women for whom abortion was the last choice they ever made. The signs are easy to make, and now the foam board, that used to cost more than $3 a sheet at office supply stores, is available for $1 a sheet at Dollar Tree. I made a set of 40 for March for Life in DC. Raising funds is a cinch, since you just ask people if possible to donate $1 for their own plus sponsor additional signs for $1 each. A teen or church group could easily churn out a set in a day. Start by printing out the names, ages, dates of death, and so forth. You can get a file from me with the information, along with links for more info for the backs. I find that twice the width of a landscape-oriented letter-sized page is about the width of the sign. I also believe you get a nicer result if you vary the fonts among the signs. When it's time to cut the signs, you'll need something large and rounded to guide you in cutting the tops. As you can see, I used a Christmas tree stand. A trash can lid, saucer sled, or tray will do as well. Use a razor knife. I would just score the foamboard sometimes. Other times I'd stack the foam board, use a bit more force, and just slice them through. Both ways work fine -- just be careful that you don't damage your floor. If you don't cut through the whole way on the first stroke, use the razor knife to cut through the rest of the way to get a nice rounded top. Scissors don't work well; they tend to mash the board and not give you a nice clean cut. Cut the words for the front from the page where you've printed them. I've found that the double width of a landscape-oriented letter-sized sheet is just the right width. I can't see any real advantage in using legal sized paper, because it's not wide enough for the sign if you use a single sheet, and it's two wide if you go twice the width. Ledger sized paper would probably work well. Spray adhesive works best. It allows you to reposition the words if you need to. The adhesive is inexpensive and available in the craft department of Wal-Mart, though if you prefer you can also get it at craft stores. Just be careful when you spray -- it tends to land on other things around the signs you're working on. Put old newspapers down if you don't want a thin sticky layer of glue on the floor. With the spray adhesive, you have plenty of time to place the words on the sign. You can move them if you need to. I find that the razor knife works well for lifting the edges for repositioning. Just be warned -- your hands will get pretty gunky with a mix of glue and printer ink. Print out each woman's story and put it on the back. You can also add copies of relevant documents that I link to, such as medical board disciplinary documents or news clippings. I put pictures on the front when I can get them, with additional pictures on the back when a woman's story has more than one photograph with it. This enables people to become familiar with the stories of the women, both to educate themselves and to answer questions. Make sure you print out a copy of the list so that you can verify that you got all the signs back at the end of the event. By checking them off, you can spot any missing signs and easily replace them. A woman identified as "Patient A" (I'll call her "Adelle"), was 26 years old and had a history of anemia and sickle cell disease when she went to Dr. Mi Yong Kim's private office, which was named "Landmark Women's Center", giving the impression that it was a clinic. Kim did not order proper lab studies, document an appropriate history, or perform a proper exam on Adelle before performing a safe and legal abortion on her on November 16, 2002. Kim administered 25 mg of Versed to Adelle, in response to her reports of pain, over a 10-minute period, without giving the medicine time to take effect. Kim told the medical board that she did not give Adelle any analgesia for pain because she gives enough Versed to cause amnesia so that the patient can't remember the pain. The board noted that Kim lacked judgment and knowledge of intravenous conscious sedation and that she was not fit to supervise a CRNA. At the end of the abortion, Kim noted that Adelle's pulse oximeter reading was only 70%, an alarming finding. Kim thought she found a pulse, so she did not assess whether or not Adelle was breathing. She simply ordered her staff to give Adelle oxygen by mask and call 911. Kim administered Romazicon to reverse the effects of the Versed, but did not notice that Adelle had gone into cardiac arrest. As such, Kim made no effort to resuscitate her. The ambulance crew arrived and transported Adelle to the hospital, where she was declared dead from possible air embolism. The medical board noted that Kim was not certified in Advanced Cardiopulmonary Life Support, nor was she or anybody else on her staff qualified to perform an intubation or use crash cart equipment. Kim did not document the operative report for Adelle. Kim told the board that the police had told her not to make any further notes in her file. 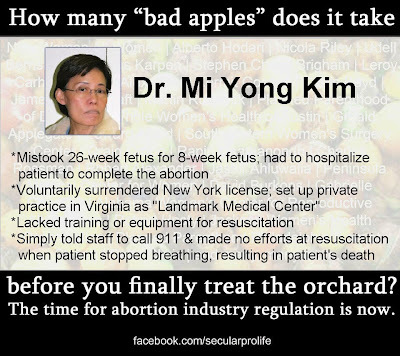 Although Kim had voluntarily surrendered her license in New York before opening her looked-like-a-clinic, the Virginia medical board did not suspend or yank Kim's license, instead noting that she was making improvements in her quality of care. She was instead placed under stipulations regarding her use of anesthesia in her office and her record-keeping. On November 7, 1882, 23-year-old Elizabeth "Lizzie" Holstein of Philadelphia grew ill with fever and chills. Over subsequent days, as she grew progressively more ill, she spoke to her aunt and confessed that she was ailing from the effects of an abortion performed by her dentist, Dr. George Buchanan, on the night of October 7. She also made a similar deathbed statement to Dr. Samuel D. Marshall, had attended to Lizzie in her final sickness. In spite of all that Dr. Marshall could do, Lizzie died on November 16 from cumulative blood loss. Dr. Marshall notified the coroner's office. The police came to the house and got Lizzie's false teeth, which they brought to Buchanan. He identified them as his work, whereupon he was arrested. Some confusion arose as to whether the dentist Lizzie had meant was the recently arrested Dr. Buchanan or his father, also named George, who sometimes worked in the dental office when he wasn't in prison. George Buchanan the younger was convicted in Lizzie's death, but was quickly granted a new trial. I have been unable to determine if the trial actually took place and, if so, what the outcome was. On November 16, 1905, 18-year-old Dorothy Spuhr died in County Hospital in Chicago from an abortion performed on November 13. Midwife Julia Gibson, aka Timmons, was arrested and held by the coroner's jury. Gibson went on to perpetrate a fatal abortion on Bessie Braun the following year. There are three abortion deaths in the Cemetery of Choice for this date. I have an abundance of information on the first, but a dearth on the others. On November 15, 1901, 22-year-old Irma Brown of Garden City, Kansas, died at County Hospital from complications of an abortion. Dr. Robert E. Gray, age 42, was arrested November 19 and held without bail. The original accusation had come from nurse Margaret Tedford, who had cared for Irma after she'd taken ill.
A police captain said that he had spoken to Irma as she lay dying, and that she said Gray had performed an abortion on her. There was doubt as to whether Irma's confession would be admitted in the trial because it had been written out by the police officer, but Irma had not signed it. 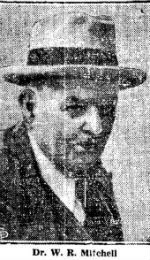 Daniel Healy, the hospital warden, testified that Dr. McPherson at County Hospital had not allowed Irma to sign it because she was so weak that he feared the exertion of signing the document might kill her. Gray insisted that Irma had undergone an abortion elsewhere at the Veley Hotel and didn't want to go to the county hospital for aftercare lest her family find out. At Irma's request, Gray had taken her to Chicago and registered with her at the hotel on November 1, under the names of Irma's sister and brother-in-law. He further said that she had asked to go for a walk through the La Salle Street Tunnel, so that she could tell her family and friends that she had actually been under the Chicago River. Because of this walk, he said, Irma had suffered a fall that had injured her so that he took action to save Irma's life. Gray's assertion was weakened by a letter from Gray that Nurse Tedford produced, saying, "My defense is just as I told you and will not be deviated from. It is that Irma slipped and fell in the tunnel a week ago. This defense will not be deviated from one iota or one jot. Remember, remember. Read quickly; decide quickly. Then destroy. bring no letters or papers of any description." Gray's defense was further weakened by his cross-examination, during which he admitted that Irma had gone to the theater with him the evening after the fall..
On March 16, the jury took six ballots over six and a half hours of deliberation. The issue at hand was whether or not the abortion which Gray had admittedly performed had been necessitated by injuries Irma had suffered after a fall. The first ballot stood nine for conviction and three for acquittal. The second found seven for conviction and five for acquittal. With each successive ballot, the jury shifted toward Gray until he was finally acquitted. Gray's health had deteriorated during the trial. After his acquittal he remained in Chicago until he regained his health, then he returned to his home in Garden City, where public sentiment was divided as to whether his acquittal was just or not. On November 15, 1912, 38-year-old Ida Kloie died in her Chicago home from an abortion perpetrated by midwife Minnie Neermann. Neerman was held by the Coroner on November 25, and indicted by a Grand Jury on December 1, but the case never went to trial. That same day, 33-year-old homemaker Fannie Scheiner died at County Hospital in Chicago after an abortion perpetrated that day by midwife Annie Balnoka. Balnoka was arrested and held by the Coroner on November 24, and indicted by a Grand Jury on December 15, but the case never went to trial. On November 13, 1910, 32-year-old Norwegian immigrant Pauline Braasch died in her Chicago home from an abortion performed there, possibly that same day. Dr. Elizabeth Burns was indicted for felony murder in Pauline's death. The source has no record of the case going to trial. Note, please, that with issues such as doctors not using proper aseptic techniques, lack of access to blood transfusions and antibiotics, and overall poor health to begin with, there was likely little difference between the performance of a legal abortion and illegal practice, and the aftercare for either type of abortion was probably equally unlikely to do the woman much, if any, good. For more information about early 20th Century abortion mortality, see Abortion Deaths 1910-1919. WIS-TV and ABC-4 have reported that three South Carolina abortion clinics and two waste disposal companies have been caught dumping fetuses in landfills after disinfecting them with steam. The combined fines against the businesses range from $2,200 and $21,15 and total nearly $51,000. The clinics are Greenville Women's Clinic, Planned Parenthood South Atlantic in Columbia, and Charleston Women's Medical Center. The investigations into abortion practices were launched by Gov. Nikki Haley in response to undercover videos in which Planned Parenthood employees discussed their woes in disposing of fetal remains. An audit of previous state inspection records had revealed lax oversight. Two of the three clinics subsequently were slapped with fines and had their licenses suspended for other violations. Greenville Women's Clinic reportedly addressed six violations, including failure to accurately list medications available in the emergency kit. Their doctors are Terry Lynn Buffkin and Thomas William Campbell, Jr. Planned Parenthood South Atlantic in Columbia, SC submitted a plan of correction for 21 violations in order to remain open. 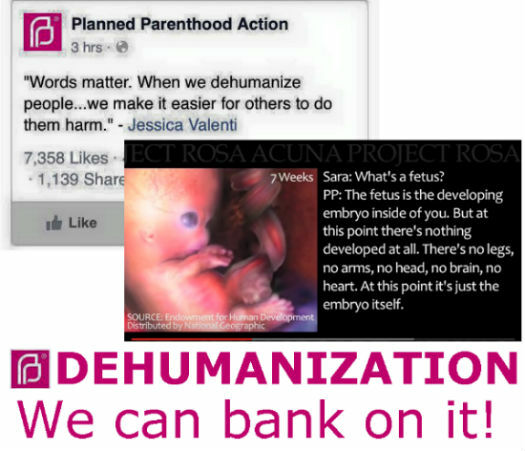 The Planned Parenthood violations included failure to verify credentials and background checks on employees, failure to have staff properly trained in CPR, failure to provide proper safety and emergency training to employees, expired medications, and storing sterile and non-sterile equipment together. Read the inspection report here. Their doctor is Jack Maxwell Valpey. Charleston Women's Medical Center , which did not have its license suspended, had challenged state licensing laws and lost their appeal in August of 2000. Their doctors are Angela Richardson Dempsey-Fanning, Gary Clayton Boyle, Gretchen Anne Reinhart, James Collis Oliver, Nicholas Stuart Fogelson, Richard Oliver Manning, and Wesley Frazier Adams Jr. Boyle pleaded down after threatening and pointing a gun at prolife protesters. Manning has been in trouble for doing abortions without hospital admitting privileges, and was sued over the abortion death of Brenda Vise, a botched abortion resulting in a hysterectomy, and mishandling an obstetric case in a way that resulted in injuries to the baby. On October 12, 1877, Nellie Ryan, an unmarried 21-year-old white woman from Turner Junction, Illinois, died in Chicago due to a criminal abortion perpetrated two weeks earlier. The autopsy report noted "The internal surface of the womb showed no marks of violence, but was inflamed and in the incipient state of gangrene." Amelia Spork, a doctor or midwife, was arrested for Nellie's death but released by the Coroner's Jury. A man named Dougherty was sought by police in connection with the case, which was considered a double homicide. On November 12, 1917, 22-year-old homemaker Margaret Linstrom died at Chicago's American Hospital from an abortion perpetrated by Dr. Anna Sorenson, who was indicted and released. 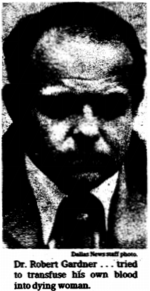 Sorenson had performed the fatal abortion on Emelia Gorman earlier that year, and went on to kill Margaret Crowe in January of the following year. Her chain of death ended with her own death in prison while awaiting trial after her January 15, 1918 arrest. On November 12, 1952, 22-year-old Isabell Cuda died in Rockford, Illinois from complications of an abortion. A 75-year-old midwife named Mary Murawski was convicted in Isabell's death. Isabell's mother had arranged the abortion because Isabell's husband had abandoned her. Murawski used the then-common abortion technique of putting a rubber catheter tube into Isabell's uterus and leaving it there overnight. The next day, Murawski added her own twist, removing the catheter and administering a douche which, predictably, caused the infection that killed Isabell. Murawski was sent to prison for killing Isabell. On November 10, 1870, Eugenie Chauvet died "under circumstances that unquestionably indicated criminal practice. The coroner examined Eugenie's body the following day. He testified, "I found that her death was brought on by injuries inflicted on the womb." She was not pregnant at the time of her death but her uterus was enlarged, indicating a recent pregnancy. He believed that the two injuries had been caused by "a sharp pointed instrument." He had examined some powders associated with the case, and concluded that they were morphine. Simon M. Cohen, an astrologer, was charged with arranging the abortion. At the coroner's inquest, Mrs. Julia Harvey testified that before dying, Eugenie had told her that Dr. C. C. O'Donnell had performed an abortion on her. Cohen also testified that O'Donnell had admitted to him that he had perpetrated an abortion on Eugenie. Frederick Downer, a carpenter, said that he had known Eugenie for about five months when she had asked him to arrange a room for himself at Mrs. Harvey's establishment. He saw Eugenie two or three times a week. Eugenie, he said, became ill with chills and fever and took to bed at Mrs. Harvey's house, where she was visited by a man asking if there was a sick lady there. The person in question, whom Downer pointed out, was O'Donnell. After being there for about two hours, O'Donnell had sent Downer out to a pharmacy with a prescription for some powders, which Downer had obligingly obtained. Downer said that Eugenie remained sick with chills and fever for about six weeks. However, the case was thrown out because it hadn't been ascertained that Eugenie had known that she was going to die when she told Mrs. Harvey about the abortion, thus her statement was inadmissible as a deathbed statement. Demetrice Andrews, age 22, underwent an abortion on October 17, 1988. She became progressively ill, and was finally admitted to Grady Memorial Hospital in Atlanta. Demetrice suffered multiple organ failure. She died on November 9, 1988. It is ironic that Demetrice was admitted to Grady to be treated for abortion complications. Another woman, Jacqueline Reynolds, died just two years earlier, from complications of anesthesia administered for an abortion performed at Grady. "Yvonne" Roe is one of the women Life Dynamics notes on their "Blackmun Wall" of women killed by legalized abortion.Yvonne was a 19-year-old student who died from sepsis on November 9, 1999 in Marrero, Louisiana, after undergoing a safe and legal abortion. She had been an All-American cheerleader and a member of the National Honor Society.Life Dynamics cites the Clarion Ledger, November 11, 1999, and indicates that though they have information giving Yvonne's real name, they can not release it due to a confidentiality agreement. Eighteen-year-old Christine Mora underwent a safe, legal abortion at Doctors' Surgical Center in Cypress, California -- an FPA (Family Planning Associates Medical Group) facility. She was about 17 weeks pregnant and a high school senior. The date was November 2, 1994. A nurse practitioner inserted laminaria (dried sticks of seaweed which absorb moisture and expand) to dilate Christine's cervix. Christine went home and returned the following day for the abortion. Dr. Thomas Grubbs performed the D&E and sent Christine to recovery. Preparing to leave the clinic, Christine fell while unattended. Grubbs was called to check her, and noticed slurred speech and inappropriate responses. Somebody called an ambulance, and Christine was taken to La Palma Hospital, where she spent several hours in the emergency room, attended by her friend Robert. When Christine's father was finally located, Robert had to tell him about the abortion as well as about the hospitalization. Christine was admitted to the intensive care unit, where her condition deteriorated until she was finally taken off life support at noon on November 8, and pronounced dead. Christine left an 18-month old child motherless. The autopsy showed acute septicemia and hemorrhage in the brain, along with some small cervical lacerations. It also revealed that Christine had a congenital heart defect called "foramen ovale," in which a connection between the two sides of her heart had not closed at birth as it was supposed to do. Her family filed a wrongful death suit. Grubbs had never examined Christine prior to the surgery. In fact, he'd had no contact with her at all prior to beginning her abortion. "The anesthesia record says that Dr. Grubbs did the entire extraction procedure in three minutes(emphasis in original)," and that this haste caused the cervical lacerations. The lawsuit had gone to trial, with Allred himself taking the stand, when prolifers discovered that Allred was being sued and complained that the medical board and news media were ignoring the death. 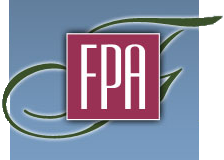 As soon as the prolifers began agitating, FPA quickly settled with the family, stipulating confidentiality as part of the settlement. Allred's facilities remain members of the National Abortion Federation despite these deaths. Mr. and Mrs. William J.F. Bullerman ran "a rather mysterious sort of rookery" in Chicago. On November 8, 1879 police discovered a woman named Elizabeth Foley, aka Sarah Monshan, seriously ill with septicemia at that "rookery." Police suspected that the abortion had probably been perpetrated by Dr. Franklin Brooks, "who, a few years ago, was awarded six years at Joliet for abortion." Elizabeth's sister, Mary Monshan, was also held as an accessory. 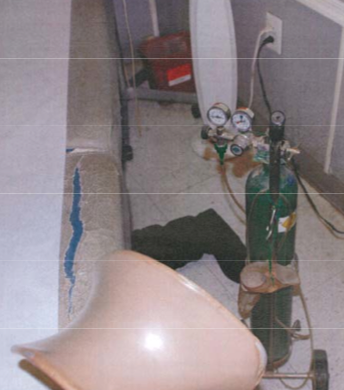 They took Mrs. Foley to Cook County Hospital, where she died later that day. To the end, Elizabeth denied having undergone an abortion. She insisted that she'd given birth and that her sister, Mary, and taken the child to their mother's home in Greenbaugh, Wisconsin. Mary denied this, and her employer told police that she'd not been out of town at all. The post-mortem examination showed that Elizabeth had indeed died from an abortion. The Bullermans were easy enough to find and charge with a crime, since they were in the county lock-up for stealing $250 in gas. As for Brooks, even after getting out of Joliet for abortion, and after Elizabeth's death, continued to practice in Chicago. On December 22, 1891, a Swedish girl named Tillie Thom was found dead from an abortion at Brooks' office. Back before legalization, Jesse Ketchum (November 7, 1917 - July 20, 2005) operated his abortion practice alongside a legitimate (if somewhat lawsuit-prone) medical practice. Although Ketchum's criminal abortion practice wasn't the best in the world, he evidently maintained some standards and protocols for screening patients. No patient deaths have been attributed to Ketchum's criminal practice, though he was arrested a total of three times for perpetrating abortions, and was convicted of breaking federal tax laws,and for obscene conduct in a pornographic movie theater. He settled or was judged against in nine malpractice suits. Ketchum who kept abortion instruments in his house and perpetrated abortions in a motel room. Clergy Consultation Services (CCS), an organization created specifically to refer women to abortionists, began referring women to him. In late 1969 or early 1970, Ketchum was arrested after an undercover policewoman arranged for him to perform an abortion at a motel in Southfield, Michigan. She had been referred to Ketchum through Clergy Consultation Service. The Michigan Women's Commission and CCS responded to Ketchum's arrest by starting a drive to repeal laws against abortion. County Prosecutor Thomas Plunkett objected to feeling forced to prosecute Ketchum because he, himself, favored abortion rights. Whether allowing the likes of Jesse Ketchum to ply the abortion trade without let or hindrance was not even taken into consideration by his supporters. 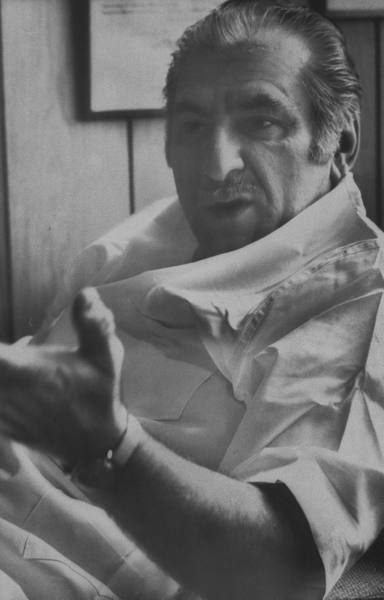 When New York legalized abortion on demand in 1970, 52-year-old Ketchum -- assisted by his wife, Judith, nearly 30 years his junior -- set up shop in a Buffalo motel suite. For Ketchum, New York must have seemed like the Promised Land. 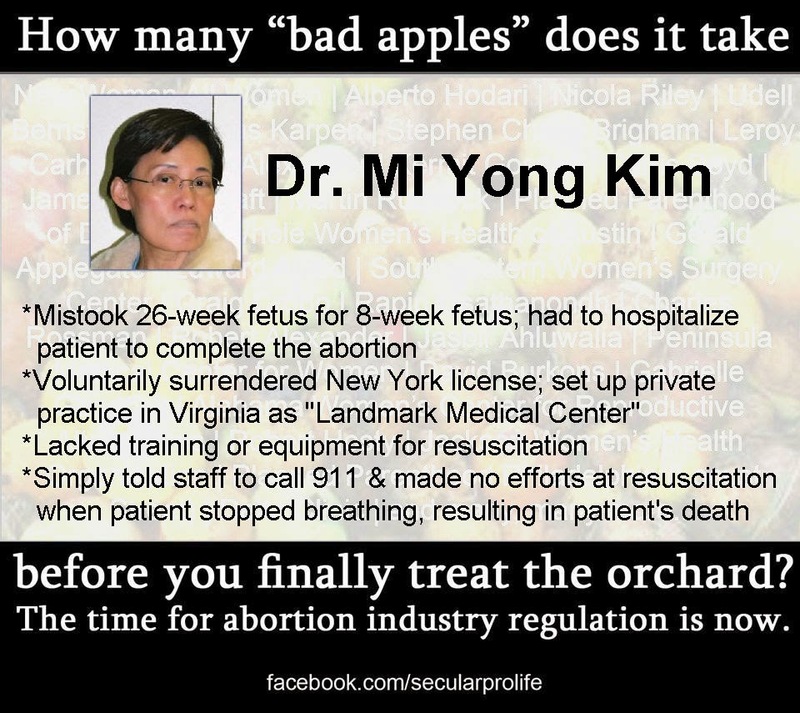 Abortionists were flaunting safety standards with impunity. Practices such as injecting patients with saline then sending them home to abort raised eyebrows, to be sure, but they didn't get anybody thrown in jail even if the woman died. CCS continued to refer women to Ketchum in his new location. On May 28, 1971, Ketchum did a D&C abortion under general anesthesia on Ellen K. Lawler of New Baltimore, MI, in his Buffalo office. Only later, at an undisclosed time, did Mrs. Lawler discover that Ketchum had lacerated her uterus, anterior cul-de-sac, right broad ligament, and peritoneum. He had told her the abortion had been uncomplicated. Such severe injuries in a criminal abortion patient would have brought the heat down on our boy Jesse. But this was New York, abortion was legal, and although Mrs. Lawler suffered ill effects from Ketchum's foul-up, Ketchum himself was able to carry on. Ketchum decided to do hysterotomy abortions -- which involve slicing the uterus open to remove the baby -- in his office. It didn't take long for this practice to turn deadly. In the second half of 1971, Ketchum caught the eyes of the authorities by allowing two hysterotomy patients to bleed to death. His first victim was 25-year-old Margaret Smith, who had traveled from Ketchum's home state of Michigan to New York for a safe and legal abortion because she had been exposed to rubella. Ketchum performed a vaginal hysterotomy on Margaret at 10:30 the morning of June 16, 1971. Margaret was then left virtually unattended until her boyfriend returned at 2:00. He found Margaret unresponsive, and begged Ketchum and his staff to do something. Ketchum was verily astounded when he was charged with criminally negligent homicide in Margaret Smith's death. Abortion, after all, was legal. How could one be prosecuted for doing something legal? And evidently he didn't think the state could possibly succeed in their case. He kept taking risks with patient's lives Before his case went to trial, he performed a similar abortion on 37-year-old Carole Schaner of Ohio on October 20, 1971. Carole was 14 weeks pregnant. After the abortion, Carole went into shock, and was taken to a hospital. Despite all efforts, Carole died before doctors could even fully assess the extent of her injuries. She left behind four children. Ketchum was convicted of criminally negligent manslaughter for Margaret's death on October 26, 1973, despite the fact that renowned abortionist Milan Vuitch (who had challenged the District of Columbia abortion law) testified on his behalf. Margaret's parents sued him for $350,000. Ketchum tried various legal moves to stay out of prison. When Roe v. Wade was handed down and assorted criminal abortionists started getting their old convictions thrown out, Ketchum tried Roe for leverage. He got nowhere. Eventually, he was sentenced to prison. Ketchum served little time, however. He was released after less than a year, and relocated to Florida. Ketchum had asked to take the test to become licensed in Florida but his request was denied. In spite of this, he found work at the University of Miami School of Medicine, at Jackson Memorial Hospital, and at the VA hospital in Miami, from September of 1976 to November of 1977. It turned out that no license was required for a doctor to practice in a government operated hospital. In 1978, he and Judith divorced. While at the Miami School of Medicine, Ketchum was administering oxygen to Mrs. M for routine surgery. Rather than the 40% oxygen he was to administer, Ketchum provided only 15%. Mrs. M failed to notice until Mrs. M had gone into a coma from which she still hadn't recovered after 19 months. According to the medical board licensee lookup, Ketchum relocated to Michigan. His petitions to restore his medical license, made in 1984 and 1987, were both denied. Nevertheless, despite killing two women, he remained a free man until his death in 2005. 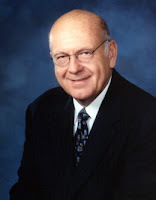 As for the former criminal abortionist, Milan Vuitch, who had testified on Ketchum's behalf -- he also had kept his nose clean as a criminal abortionist, then went on to kill two legal abortion patients. Wilma Harris and Georgianna English. 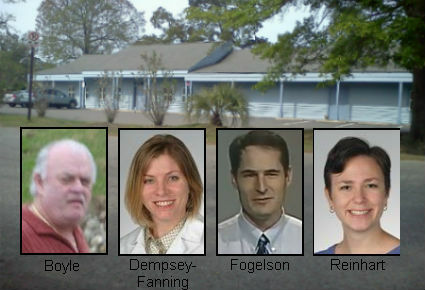 Another abortionist that I know about, Benjamin Munson, likewise, had a clean record in his criminal abortionist then went on to kill two women in his supposedly safer legal practice -- Linda Padfield and Yvonne Mesteth. Legalization -- as we can see from these specific tragedies as well as from the numbers -- did nothing to protect women from dying at the hands of abortionists. If anything, it seemed to have emboldened them to take risks they never would have considered taking were a botched abortion alone enough to carry the risk of the loss of a medical license or even of freedom. On November 6, 1914, 25-year-old Genevive Tatar died at Cook County Hospital in Chicago from complications of an abortion performed by an unknown perpetrator. Three years to the day later, 23-year-old Ms. Anna "Annie" Merriman died at her home in New Philadelphia, Ohio. Dr. C. L. Tinker testified that a man had come to his office on November 2 asking him to come quickly to Annie's bedside. Dr. Tinker found her deathly ill, with her heart racing at a staggering pulse rate of 190. Annie told him that she was ailing because of an abortion that had been performed by Dr. L. H. Hughes at his practice in Dennison, Ohio. Dr. Tinker told Annie that her only hope of survival was to be hospitalized, and she consented. She was admitted to Union Hospital in Tuscarawas County. The next day she told a hospital employee that she'd gotten pregnant by a friend, rather than by her husband, Roy, from whom she had been separated for about two years. She had only been 16 years old when they had married. Annie also told this woman, in front of two other witnesses, about the abortion, saying that he had been performed on October 25. Annie's condition never improved, and she died at 7 p.m. on November 6. She left behind three children. Two physicians who performed a post-mortem examination concluded that Annie had died of general septic peritonitis from the abortion. Hughes was arrested in her death. On November 4, 1928, 22-year-old Norwegian immigrant Anna Borndal died at the office of Dr. Lou E. Davis of Chicago, from complications of an abortion performed there that day. Davis was held by the coroner for unintentional manslaughter. She was indicted by a grand jury for homicide. Anna's abortion was typical of illegal abortions in that it was performed by a physician. Anna was not the only women to have died at the hands of Dr. Davis. Davis had already been implicated in the 1913 abortion death of 27-year-old Anna Adler and the 1924 abortion death of 26-year-old homemaker Mary Whitney. On December 1, 1928, yet another Davis patient, 23-year-old Esther V. Wahlstrom died from an abortion. This time Davis was at last convicted for her crime. he was free before long, however, and on May 19, 1932, 24-year-old Irene Kirschner died after an abortion perpetrated by Davis, who later faced three trials in three years over the February 7, 1934 abortion death of Gertrude Gaesswitz. During the first two thirds of the 20th Century, while abortion was still illegal, there was a massive drop in maternal mortality, including mortality from abortion. Most researches attribute this plunge to improvements in public health and hygiene, the development of blood transfusion techniques, and the introduction of antibiotics. Learn more here. Louchrisser Jackson, a 23-year-old married mother of five, was 12 weeks pregnant when she went to Dr. Robert L. Gardner for a safe and legal abortion at Reproductive Services in Dallas on November 4, 1977. Louchrisser began hemorrhaging. Gardner said that he ordered blood for a transfusion, but it didn't arrive so about an hour before her death he attempted to give her a transfusion with his own blood -- which turned out to be an incompatible type. A private ambulance was called but was not informed of the nature of the transport. In that jurisdiction, private ambulances are only permitted to transport stable patients; they are prohibited from responding to emergency calls. Because the ambulance service had no reason to expect an emergency, they did not respond promptly, nor did they refer the transport to the fire department's ambulance service. When the ambulance crew arrived, Louchrisser had gone into cardiac arrest. The crew, upon discovering that they'd been called for an emergency transport, rushed Louchrisser to the hospital immediately rather than calling for a fire department ambulance. Louchrisser died that day. Gardner requested that the body be released without an inquiry. Another physician at the hospital learned of the case and requested an inquiry. The autopsy found massive hemmorage of at least two liters of blood, and a "1.8 x 2 cm. ragged perforation in the right lateral wall just above the internal os of the cervical canal. This perforation communicates freely with the retroperitoneal space on the right side. The endometrial surface of the uterus is ragged and hemorrhagic." Death was attributed to "massive retroperitoneal hemorrhage due to perforation of the uterus during a therapeutic abortion." The clinic was allowing counselors with no medical degree to give medical advice and perform medical procedures. Staff were not informing patients of risks. There was not emergency equipment on hand. Gardner himself testified against the clinic, stating that they ran "an assembly-line operation." "Gardner admitted the clinic took only one or two minutes between operations, and used black-tarnished surgical instruments and 'switched sterile gloves between operations but never scrubbed down.'" Twenty-six-year-old Moris Helen Herron went to Bakersfield, California Dr. William D. Stanley for a tubal ligation in October of 1983. When Stanley examined Helen, he informed her that she was pregnant and asked if she wanted him to perform a safe, legal abortion when he did the tubal ligation. Helen consented, and on October 23, Stanley operated on her. After Helen went home, she suffered weakness, vomiting, and severe pain. She called Stanley, who instructed her to take a laxative. 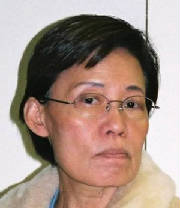 Helen developed a high fever, and died on November 3. An autopsy found feces and feculent fluid in Helen's abdominal cavity from a hole in her intestines. Helen's mother, Inez Herron, sued Stanley on behalf of her two surviving children, and Stanley settled out of court for $200,000. When a local pro-life group wrote to Stanley to chastise him for his treatment of Helen, he wrote back, saying, "Elective abortion refers to termination of a live viable pregnancy upon the request of the mother. I have never performed this service or even offered it." He claimed that he was merely performing a D&C on Helen after a miscarriage. On November 2, 1876, 19-year-old Mary Hermann was admitted to New York's Mount Sinai hospital, suffering from compilations of an abortion. She died the following day, November 3. There, Mary gave a deathbed statement asserting that the abortion had been perpetrated by midwife Johanna White, a German immigrant. Mary was herself a German immigrant, and had learned of White's abortion business from an advertisement in the Staais-Zeitung. I believe I will not live, and make this statement. I was a servant for S. Meltzner, living at 160 East Sixtieth street; I am not a married woman; after I found I was pregnant, I wanted to get rid of the child; I went to Mrs. White, of 209 Allen street, to have an operation performed; I went there on the evening of October 23 and she operated upon me; it pained me very much and I went home; on October 26 I went again to Mrs. White, as I had not been relieved; she then applied a rubber instrument and I left; on the evening of October 27 I went again, as nothing had passed from me; she again used instruments; on Saturday evening hemorrhage took place; on Sunday I had a great deal of pain, and last Tuesday Morning Dr. Hirsch came to see me, and attended me, but I did not tell the doctor what was the matter with me; by his advice I was sent to Mount Sinai Hospital this morning; no one was in the room with me except Mrs. White; no one advised me to go to Mrs. White to be operated upon; I read the advertisement in the newspapers; the father of my child is a steward on board of a steamer, and is not now in New York. Mary said that she was exposing White as her abortionist not out of revenge, but to prevent other young women from entrusting themselves to her. White already had a reputation as an abortionist. When arrested for Mary's death she said that she had a vague recollection of Mary coming to her a month earlier requesting an abortion, but insisted that she had refused to perform the abortion. Claims about the safety of legal abortions rest upon the presumption that the Centers for Disease Control keep track of abortion deaths. The case of Latachie Veal should lay that presumption to rest. Latachie was 17 years old, and 22 weeks pregnant, when Robert Dale Crist (pictured) performed an abortion on her at Houston's West Loop Clinic November 2, 1991. According to Latachie's family, she bled heavily at the clinic, and cried out to the staff for help. They told her that her symptoms were normal, and sent her home. Several hours later, Latachie stopped breathing. Her brother-in-law called 911 while her sister did CPR, to no avail. Latachie was dead on arrival at Ben Taub Hospital. If Latachie's death certificate had been filled out properly, with the notation of the abortion in the proper box, using the proper ICD-9 code, then theoretically the National Center for Health Statistics would spot the abortion code and report it. But most states send only a statistical sample of their death certificate data to the NCHS. So the CDC would be notified of Latachie's death through the NCHS only if the death certificate was properly filled out, and Latachie's death certificate was among those abstracted and sent to the NCHS. But still, according to abortion defenders, Latachie's death would nevertheless be automatically reported to the Centers for Disease Control. They're not clear on who is supposed to report the death. Was West Loop Clinic supposed to report it? Was Crist supposed to report it? Was Ben Taub Hospital supposed to report it? Was the medical examiner supposed to report it? Was the Texas Department of Health supposed to report it? The CDC says it gets abortion death information from abortionists, abortion facilities, hospitals, and state health departments, but it does not mention that the reporting is not mandatory. This does not mean that Latachie's death went utterly unnoticed. Latachie's family filed suit, retaining the flamboyant "Racehorse" Haynes as their attorney. The case was highly publicized, both in Texas and in Missouri, where Crist had performed a fatal abortion on Diane Boyd, a 19-year-old developmentally disabled woman who had been raped in the institution where she'd lived. The mainstream publicity went beyond the usual newspaper articles, with Crist giving television interviews calling the publicity "media hype" and "a political event." Haynes retorted, "I wish he would have a copy of the 911 tape.... If he would talk to the parents, if he would talk to the sister as she gave her CPR or talk to the brother-in-law as she was breathing her last breath and see then if he thinks it's a media event." With all this mainstream publicity in two states, prolife organizations picked up the story, and it was reported in prolife newsletters around the nation. A lot of people very quickly found out about the abortion death of 17-year-old Latachie Veal. 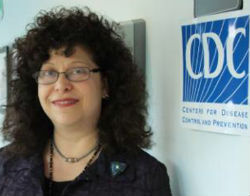 But did the CDC? At the 1992 National Abortion Federation Risk Management Seminar in Dallas, Crist spoke openly of Latachie's death. (He did not, of course, mention her name; I've concluded that he's discussing Latachie's death, since there's been no evidence of any another 17-year-old abortion patient of his who died in 1991.) Crist blamed the death not on malpractice, but on disseminated intravascular coagulopathy, a clotting disorder sometimes triggered by injury or infection. Present at that Risk Management Seminar, where Crist chattered about Latachie's death, were two -- count 'em -- two-- staffers from the Centers for Disease Control's abortion surveillance activities area: Stanley Henshaw and Lisa Koonin. Henshaw's presence isn't quite as remarkable as Koonin's. It was Lisa Koonin, specifically, whose job it was to "verify" abortion deaths, and obtain copies of death certificates. These she was to pass on to a research fellow, Clarice Green, who would then gather the full information about the case. Lisa Koonin does what they pay her to do. In spite of all the publicity, in spite of the lawsuit, in spite of the prolifers shouting from the rooftops, in spite of the abortionist discussing the death at an event attended by the very woman whose job it was to notice abortion deaths, the Centers for Disease Control did not notice Latachie's death. Their 1991 Abortion Surveillance Report, published in May of 1995, did not even make any mention of abortion mortality. And when we at Life Dynamics filed a request for information about abortion deaths, we found that the CDC counted zero -- count 'em -- zero -- abortion deaths among women of Latachie's race in the 15 - 19 age range. In other words, they didn't even notice. Not to put too fine a point on it, but if the CDC failed to notice this highly-publicized death, discussed openly at an event attended by two of their abortion surveillance staffers, exactly what does it take to get them to notice an abortion death? And how can we even pretend to believe that any serious attempt to accurately count abortion deaths was being made?